On the evening of Thursday, Nov. 8, students gathered in the Harmon Room of the DeWitt Wallace Library for the second Cornerstone Forum of the semester – featuring new Dean of Multicultural Life (DML) Marjorie Trueblood. Trueblood began by describing the responsibilities associated with her position, which include supervising five staff members who are split between the Lealtad-Suzuki Center and the Center for Access, Retention, and Success (CARS). Trueblood started at Macalester this year. So far, much of her time has been spent formulating the college’s response to the four separate instances of hate markings and speech found on campus. Prior to arriving in Minnesota, Trueblood served as Associate Director of Diversity and Inclusion at Southern Oregon University – where she was engaged in similar work. There, much as she has done here this year, she helped create a Bias Response Team set up to support students and respond directly to incidents of hate. 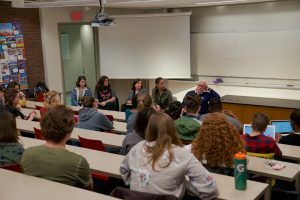 In her role thus far, Trueblood has met with a number of students to discuss incidents of bias and how best the institution should respond to them. Trueblood also worked extensively in planning the new diversity and inclusion trainings for faculty, staff and students that are being led by Dr. Jamie Washington. Washington is the President and founder of Washington Consulting Group, a multicultural organizational development firm based out of Baltimore, Maryland. Dr. Washington signed a one-year contract with Macalester in early fall 2018 and has been to campus several different times this semester. Trueblood was first introduced to Washington’s work while in college at Earlham College. One faculty diversity and inclusion training was held during the Fall Academic Issues Retreat (FAIR), in September. The retreat’s title was Transforming Macalester, Transforming Ourselves: Strategies for Creating Equitable Learning Environments, and over 115 faculty members from every academic department were in attendance. In addition to bias response and diversity training, Trueblood mentioned that she wants to expand the DML’s role in facilitating civic engagement. 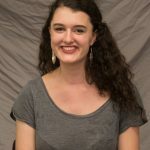 “We’re starting to think about how we can be more involved in supporting student activism, and even student protests, because [they’re] also a form of engagement,” she said. Trueblood concluded the event with a comment on the mission of her department at large for the students in the audience to reflect on.